Shinjuku is the town where various people such as students, company workers and sightseers gather. The sushi restaurants in the town which sees people of all ages are widely assorted from a stand-up-styled sushi where you can just casually pop in to a top-class one which you can use for business entertainment and as a bonus the opening hours are variable. 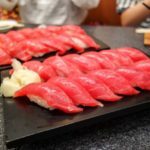 I’m introducing the recommended sushi restaurants in Shinjuku from which you can choose depending on your purpose. When you visit Shinjuku, please enjoy the delicious sushi. When you walk for about 8 minutes from the south-exit of the JR Shinjuku station towards the Metropolitan Government Office Building, the [Tsuribunejaya Zauo] is on the 1st floor in the Washington Hotel on the north-side of the Metropolitan Government Office Building. It is a seafood tavern with a warm atmosphere, feeling scent and warmth of wood. The selling feature of this restaurant is that you can catch a fish in the fishing pond by yourself, borrowing a fishing rod from the restaurant and you can eat it later. The price is different depending on the fish you caught, but they prepare it on the spot for you. So, you can taste the extremely fresh sushi. Of course, they offer sushi without catching, but sometimes, catching a fish is cheaper in price. It is a popular menu. 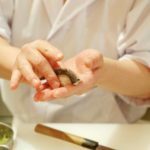 Please experience this unique sushi restaurant in Shinjuku. The [Sushi Rosan Shinjuku-ten] is on the 7th floor in the Isetan Shinjuku-ten at the corner of the Shinjuku 3-chome junction which is a 3-minute-walk towards east from the JR Shinjuku station.The appearance of the restaurant looks simple and for this reason it makes you feel classy. There are the counter-seats and the table-seats, but a counter-seat from where you can watch the chef’s skillful work while you are eating is the best. 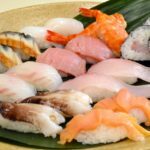 When you hear, “Honkaku nigirizushi” (authentic hand-shaped sushi), it may sound very expensive, but even the [Jo-zushi] (superior sushi) which is the set of nigiri and the rolled sushi costs ¥2,160 which is slightly cheaper for this class of sushi restaurant. The colourful sushi, [Fukiyose-chirashi] which stimulates your appetite is the same price. Please enjoy some, watching the chef’s hand technique. 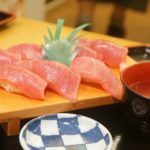 The [Sushimaru] is located near the Shinjuku 3-chome nishi junction which is a 2-minute-walk towards east from the east-exit of the Shinjuku station. It has just re-opened in April 2017. The recommended lunch menu of this restaurant is the [Ika-don] which contains plentiful surumeika (common squid), ika-kimo (squid liver), ikura (salmon roe) and tobiko (flying fish roe). This filling [Ika-don] costs ¥850! It is a value for money for Shinjuku which is the town for business as well as for sightseeing. To people who prefer nigiri (hand shaped sushi) to donburi (sushi on rice in a bowl), the lunch-nigiri is recommended. You can have the nigiri, using the white fish meat or salmon for ¥1,000. Please use this restaurant! The [Kizuna-sushi Shinjuku Kabukicho-ten] which is famous for the chain restaurant with their motto, “not go round, but cheap” is a 6-minute-walk from the east-exit of the JR Shinjuku station. The gigantic signboard with the colourful nigiri photo is their land mark. The value for money is proven when sushi on a plate is ¥99! On the top of that, they have the all-you-can-eat 100 kinds of ingredients course free for under 4 years old. 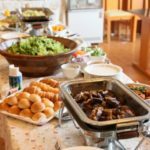 It’s especially recommended to people who are with their families. There is toro (fatty tuna), salmon, salmon roe, sea-urchin etc. The casual go-round-sushi is good, but the cheap sushi which a chef makes in front of you and you can eat them without any worry about the cost is better. There is another [Kizuna-sushi Nishi-shinjuku-ten] in Nishi-shinjuku which is in the same group. This restaurant is also very popular. Please visit either of them in a casual manner. The [Shiki-no-aji Horikawa Odakyu Hotel Century Southern Tower-ten] with the characteristic appearance as well as the highlight of Japanese sense is on the 19th floor of the Odakyu Hotel Century Southern Tower which is a 3-minute-walk from the south-exit of the Shinjuku station. This is the Japanese-styled cuisine restaurant which has been offering the kaiseki-ryori (tea ceremony dishes) and sushi. As it has a kaiseki-ryori, you may feel hesitant to go in, but the set of chirashi-sushi or nigiri costs ¥2,000 ~ ¥3,000 which is cheap for an authentic sushi. The sushi which you can enjoy at the glazed seat, viewing the wonderful scenery is exquisite. Why don’t you taste sushi for lunch or an evening meal, looking down at the townscape of Shinjuku? 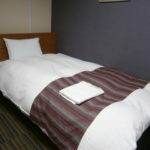 It is in a short walking distance from the JR Shinjuku station. The [Sushi Misakimaru Shinjuku Keio Mall-ten] is in the Keio Mall on the subway which stretches from the central-exit of the Keio-line to the Keio-shinsen-line and it is the stand-up-styled sushi shop which is the root of a sushi restaurant. The 2 pieces of nigiri (hand-shaped sushi) is ¥200. It is the reasonable price which only a stand-up-styled sushi shop can offer. The ingredients of the nigiri-sushi in which the freshness is crucial varies according to the season. They have a set-menu and the maguro (tuna)-nigiri 3 pieces limited to the weekdays is one of the popular menus. 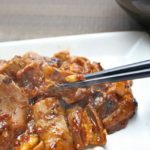 As it is located in the best place, it is truly recommended as a shop to fill your slightly hungry stomach, standing, picking up and eating casually. Please pop in at this shop when you use the Shinjuku station. The [Uogashi Nihon-ichi Shinjuku-nishiguchi-ten] with the land mark of the white shop entrance curtain and the signboard is a stand-up-styled sushi shop which is a 4-minute-walk from the Shinjuku post-office-mae junction located near the JR Shinjuku station. 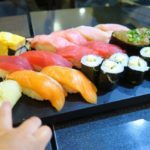 It is the stand-up-styled sushi shop which is a popular topic of conversation on the overseas website, so many foreign sightseers visit there. It is popular among them because they can experience the Japanese culture of eating sushi, standing up. The reason why the salmon and natural tuna can be offered with this inexpensive price is that they buy the ingredients at an auction. You can enjoy the fresh toppings for a cheap price at this stand-up-styled sushi shop. Please try it. The [Mikore-sushi] is near the post-office which is a 7-minute-walk from the south-exit of the Shinjuku station and the illuminated billboard on the 2nd floor of the Matsumoto-bld. is the land mark. There are the counter-seats and the table-seats which are convenient for a family. The top recommendation of this restaurant is a substantial bowl dish. 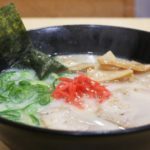 You can order an extra serving by adding ¥50, but it is not necessary because their bowl dish will easily satisfy you. The rice is served up to the edge of a bowl and the toppings on the top of it look like a mountain. No matter how hungry you are, you’ll be satisfied. It is the restaurant which is the talk of the town in Shinjuku. The [Tsukiji Tama-sushi Takashimaya-ten] is on the 13th floor in the Times Square-bld. 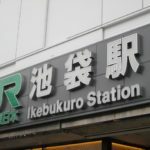 which is a 4-minute-walk from the JR Shinjuku station. Its appearance as well as the interior is full of Japanese charm and it seems to tell us as if the Edomae-sushi (Tokyo-styled sushi) must be just as classy. Having said that, the nigiri (hand-shaped sushi) is from ¥100 and the set-menu is from ¥1,900, so both are very reasonable. The recommended menu is the [Tsukiji Kaisen Bara-chirashi] limited to the lunch time. And you can taste the Chirashi-sushi (sushi rice in a box with a variety of ingredients sprinkled on top) in a miniature tub with the fresh ingredients from the Tsukiji fish market for ¥2,000. Although it is not for lunch, the [Ladies’ gozen (¥2,700)] where you can taste the variety of flavours is recommended! Please make good use of this restaurant. The [Hina-zushi Shinjuku Marui Annex] is on the 8th floor in the Marui Annex which is a 1-minute-walk from the Shinjuku 3-chome station on the Toei-shinjuku-line. 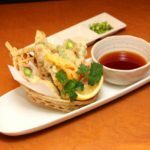 It is a sushi restaurant with a Japanese-modern interior soaked with a composed atmosphere. The popular menu is an all-you-can-eat sushi! The cost is ¥3,990 for a male and ¥3,390 for a female. You can taste high quality sushi here. The reasonably priced lunch menu is also popular. The [Lunch nigiri] for one portion is ¥990 and for a 1.5 portion is ¥1,490. They are offered to people who want to taste sushi casually. There is no loss in experiencing the all-you-can-eat sushi for a reasonable price. When you go near the restaurant, please drop in there. Let’s eat the delicious sushi in Shinjuku! What did you find in the article? I’ve introduced the 10 recommended sushi restaurants which you should visit in Shinjuku. 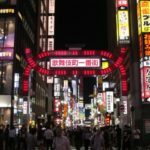 Shinjuku is famous for a town that never sleeps for 24 hours. As a sightseeing spot in Tokyo, Shinjuku can’t be ignored. Please visit Shinjuku. Many other gourmets apart from sushi will be waiting for you! Enjoy yourself!